THE channel may have burnt its fingers with Karishma-The Miracle of Destiny but that doesn’t seem to have diminished Sahara Manoranjan’s lure for former Bollywood superstars. 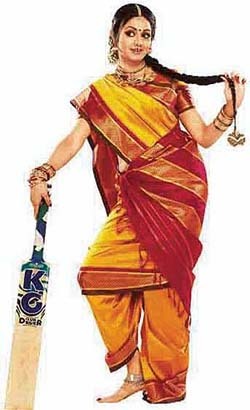 It’s now the turn of Sridevi to make her TV debut in Malini Iyer, going on air from January 19, every Monday and Tuesday at 9 p.m.
Learning from the fiasco of the over-hyped Karishma`85, Sridevi—still looking the stunner that she was---makes her small-screen debut without much hype or big ticket publicity. Malini Iyer, directed by Satish Kaushik, is a tale of simple south Indian girl who marries a failed Punjabi cricketer and unlike the Tu-Tu Main-Main of the Punjabi-Madrasi duo of Ghar Jamai, peace prevails in this household, especially between saas and bahu. Like the earlier cross-cultural serials this too has its share of comedy as Malini learns to adjust in a Punjabi environment, and how she pleads with the cricket authorities to select her husband in the national team. Producer Boney Kapoor admits Malini Iyer has been scripted with Siridevi in mind and is confident it will bring in the elusive viewers to Sahara, which is once again churning out another star-studded serial after Karishma, its much-touted channel driver, bit the dust. Discovery Channel is fast discovering that if it has to maintain its lead over competition it just has to follow one dictum—when in India do as the Indians do. That seems to be the only logic behind its sudden newfound love for India. Last month in the series Alternative Rock ‘n’ Roll Years viewers met the enigmatic Amitabh Bachchan. That was followed by an episode on the dressing style of Zeenat Amaan. Besides, in its Discover India series the channel has been showcasing exotic rituals like the Naag Panchmi, the one-of-its-kind synchronised swimming of elephants of the Andamans islands and the Darjeeling Himalayan Railway Toy Train, a Unesco world heritage site. Now the channel has pulled all stops and is going regional. On Saturday, January 17, it aired The Miracle of Malerkotla---the tiny Muslim ruled province that many feel has the blessings of Guru Gobind Singh and is protected by the shrine of the Muslim Sufi Saint Sadruddin. In these difficult times could there be a bigger symbol of religious harmony? Barely a month after pushing ahead the story of Kkusum by 20 years, Ekta Kapoor is in the fast forward mode again. Now Kaahin Kissii Roz has been put in a time machine and shoved ahead by (you guessed it) 20 years. But this time the magic doesn’t seem to be working as the soap looks as tired and jaded as it should after a marathon 550 episodes. Aired weekdays on Star Plus at 11.30 pm, Kaahin Kissii Roz drags on and on. Two decades later, Shaina has died and her place has been taken by her lookalike Devika. Is there any connection between Shaina and Devika? The question haunts Ramola and she goes to a clairvoyant. Though no answers are forthcoming the clairvoyant warns Ramola of a bloodstained locket that will surface soon. She has to find the locket before somebody else gets it. Will Ramola be able to gain control over Shaina's property after the discovery of the locket? Or does the lookalike Devika have a deeper purpose to be in Shaina’s place? No one really knows and looking at the slipping TRPs no one seems too bothered as well. For some years now, a handful of UK and US-born Indians have been attempting to make films that talk a universal language and share concerns of young Indians hyphenated between western and desi cultures. Star Movies is airing these films in its series Made in India. Featuring hits like Monsoon Wedding, Bollywood Hollywood, Jhankaar Beats, American Born Confused Desi, Split Wide Open and many more, the series is revealing the talents of avant garde film producers who are making powerful cinematic statements. Many may not be in the league of M. Night Shyamalan who made The Sixth Sense and Signs but concerns of directors like Gurinder Chadha, Mira Nair and Neeta Mehta are more real, more contemporary. These filmmakers are mirroring the predicament of young Indians coming to terms with an alien culture into which they have been born. A must-see for those who haven’t already seen these films. Look how times change. Traditionally, character artists and singers have aspired to become lead stars. Now in a role reversal of sorts, many lead stars hope to become singing sensations. What else can explain the growing popularity of item numbers that have become the current craze of most Bollywood blockbusters. Take the case of Sanober Kabir. An accomplished actress on TV she’s doing lead roles in Aroona Irani’s Tum Bin Jaoon Kahan on Zee TV and in Sagar Arts’ Arzoo Hai Tu on Sahara TV. Now she says she is waiting for an opportunity to do item numbers in films. She’s recently done a sizzling song with Sanjay Dutt and Ajay Devgan for Mehbooba. The is a Rajasthani folksy number showed her wearing traditional Indian clothes---a surprise for viewers used to seeing her in eye-popping costumes in videos like Return of Kaanta Mix and Meri Beri Ke Ber Mat Todo--currently hot favourite on music channels. Sanober typifies the new entertainment personality–a complete performer and glamorous too. Someone who doesn’t differentiate between doing main leads or performing sizzle-and-fizz numbers. After all, as she says, the botttomline is to get noticed. And how! Reliance’s Mukesh Ambani a shop floor worker`85. Apollo’s Dr Reddy an intern`85Infosys’s Nilekani a project manager. No this is not a demotion for some of India’s most visible corporate faces, it is a show that will galvanise you instantly. Every Sunday, 10 pm, on BBC World, CEOs go Back To The Floor to gain a real understanding of working life in their respective companies, to interact with their employees and face the pressures of their jobs. There’s Anil Ambani, experiencing what it’s like to be an ordinary shop floor worker in Reliance. During this special stint he collects oil samples at the Jamnagar refinery, queues for meals and travels in a crowded bus. There’s Nandan Nilekani of Infosys becoming a project manager and facing challenges that his company does daily. 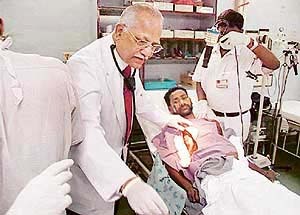 There’s the chairman and founder of Apollo Hospitals, Dr Pratap Reddy doing an intern’s stint involving handling emergencies and surgeries. Don’t miss this riveting show that provides a glimpse of how these power puff corporate honchos haven’t forgotten or neglected their roots.